This is our first food item in our 2012 holiday gift guide. I had to include the new flavor of Superpretzel because it is that good! You can have these for breakfast, dessert or just a snack! I'm planning on having a few boxes of these in my freezer over the holidays. They will be great for when I have unexpected guests and a nice treat on Christmas Eve or morning! Instead of salt, you sprinkle your pretzels with the cinnamon sugar mixture and pop in the oven. The first box I had was almost inhaled....my family loved them. But then I got some cream cheese frosting and warmed it and drizzled it over the pretzels for a dessert. Oh boy! Addicting! You can try them yourself and if you go to their website, there is a coupon for you! 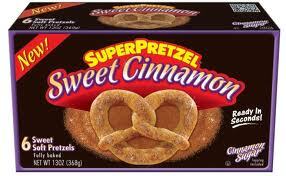 One lucky reader will win 2 boxes of SuperPretzel Sweet Cinnamon! *USA only - no PO Boxes. I love me some pretzels! Thanks for the giveaway!